We are pleased to announce that this year there will be six conference workshops held on the opening day of the conference, Monday, May 16th. There will be two workshop sessions, a morning and an afternoon session, with three concurrent workshops in each session. The workshops will be free with conference registration to attend. However, space in each workshop is limited, so attendees must sign up (select which workshops they will attend) during the registration process in order to attend a workshop. Conference attendees are welcome to attend both a morning and an afternoon workshop, see the conference agenda for specific times. NOTICE: The presenters of the original Workshop 2: Collaboration Scorecard: How to Use Metrics to Effectively Evaluate and Grow University-Industry Partnerships have withdrawn from this year's conference. We apologize for any inconvenience this may cause for those already signed up for this workshop. Please see below for a new workshop opportunity (Workshop 2). If you have already signed up for this workshop, we will be in touch soon via email about alternatives. Description: This workshop is designed to serve as an primer in team science for those who are new to the field and want to enter the conference with a deeper understanding, or as a refresher in team science fundamentals for those with prior exposure. The workshop will provide participants with foundational knowledge of the SciTS field, including commonly used terminology and conceptual frameworks, a review of the state of the science and key emerging issues, and an introduction to tools and resources available to support, manage, and conduct effective collaborative research. This half-day workshop is being organized and facilitated by Stephen M. Fiore, PhD, Associate Professor of Cognitive Sciences in the Department of Philosophy, University of Central Florida, Director of the Cognitive Sciences Laboratory at UCF's Institute for Simulation & Training, and President of the Interdisciplinary Network for Group Research. The workshop will include didactic, Q&A, and interactive break-out sessions with presentations from internationally recognized leaders in the SciTS field. This is an ideal opportunity for those interested in learning more about team science and to interacting with leaders in the SciTS field. Description: While individual and organizational networks are recognized as critical components of Team Science they are often difficult to measure empirically. Social network analysis provides a set of tools and analytic technics that enable us to investigate the structure, antecedents, and consequences of these networks. Through the use of social network analysis, we can explore how individual and organizational networks represent and describe collaborative science and also how team science can create, expand, or reshape individual and organizational relationships. Drawing on a variety of studies including evaluations of small scale funding for encouraging interdisciplinary research and training (e.g. NSF IGERT; NIH MARC), evaluations of large scale funding for advancing team science (e.g. 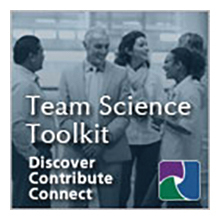 NIH CTSA; NSF EPSCoR), and research looking at how scientists use collaborative networks to navigate regulatory restrictions, we will illustrate the ways that we have used network analysis to understand team science and investigate the outcomes of team science. We will then facilitate break-out sessions to guide participants through the technical aspects of using network analysis to evaluate team science including: research design, instrument design, data collection, network analysis techniques, and presenting network analysis results. This half-day workshop is being organized and sponsored by the ASU Center for Science, Technology and Environmental Policy Studies whose researchers have extensive experience designing instruments to collect network data and analyzing networks as both a driver and consequence of team science. The workshop will be facilitated by CSTEPS Director and Professor Eric W. Welch; Mary K. Feeney, CSTEPS Associate Director and Associate Professor and Lincoln Professor of Ethics in Public Affairs; and Michael Siciliano, Assistant Professor at the University of Illinois at Chicago. Description: Successful teamwork in all professions depends upon behaviors that promote team building and collaborative thinking. Scientists may find it difficult to acquire new behaviors that are fundamental to a team science approach for a variety of reasons (e.g. personality, behaviors developed during early stages of training, or traditional requirements for academic promotion). The Immunity to Change method is designed to help adults identify and change behaviors that, despite being essential in one environment, can prevent progress toward new personal and professional goals. This workshop will explain the ITC process, provide examples of how it is being used by global business leaders for themselves and for their teams, lead participants through their own ITC maps, and discuss how we can best implement ITC as a developmental tool for the scientific research community. We strongly believe the ITC method, with buy-in from academic leaders, could become the centerpiece of professional development for faculty and promote a cultural change in how science is done. Conference attendees will benefit personally from the ITC experience by completing their own ITC maps. In addition, attendees will take away all slides, handouts, and literature necessary to bring the ITC method back to their home institutions. Description: To address complex problems and effectively engage diverse knowledge bases, it has been proposed that a new type of expertise is needed to work at the interfaces between disciplines in order to translate, facilitate, and optimize research outcomes. This active interest is shared by team science practitioners, researchers, and institutional supporters alike, with this concept being introduced by a variety of different names, including: Interdisciplinary Executive Scientist (IES), Integration and Implementation Sciences (I2S) specialist, and Research Development Professional (RDP). The I2S and RDP communities are already established and more than 30 people have signed up to join an “IES community of interest”. This half-day workshop will serve as a first opportunity to explore this fertile ground, identifying similarities and differences among the groups, brainstorming common goals and group objectives, and working toward defining ourselves to the extent this is useful in advancing those goals and objectives. Introduce techniques which help at the individual level and prepare individuals to engage more effectively in collaborative efforts. Share approaches that encourage thinking at a system level. Be an interactive experience designed to give participants information that is cognitive, emotional and actionable. Uncover the gains to be realized by reaching beyond institutional or personal benefit. Teams for large scale science projects are most often formed from those intellectually equipped in relevant technical expertise, tools and technologies. However, many teams never achieve their full potential because they fail to fully engage the human dimension. Each team member brings their emotional energy to the work at their own discretion. When that element is allowed to flourish the high­trust relationships that are developed bring the team to a new level. True collaboration is a human activity that begins inside the individual and expands outwardly to others; the team, the organization, the system. The focus of team problems is sometimes placed on particular behaviors and personality types. However, working to embrace all personalities, shifting the focus to systems, and freeing the individuals within them to be flexible in their behavioral options creates a diversity which brings wholly unexpected results. Click here for the full workshop proposal. For any questions regarding conference workshops, please contact the conference program chair at [email protected].